South Caucasus Security Forum 2017 is a 4th edition of one of the most prestigious foreign policy and security forums in the South Caucasus held since 2013. It is co-organised by the STRATPOL – Strategic Policy Institute and Georgian Foundation for Strategic and International Studies (GFSIS). This years Forum is taking place on April 20-21, 2017 in Tbilisi, Georgia. The unrecognised Republic of South Ossetia held a ‘presidential election’ and a referendum on name change earlier in April. The vote was condemned by Tbilisi and the West as illegitimate. Anatoly Bibilov, the parliament speaker, claimed victory over the current de facto president Leonid Tibilov. Over 80 % of the voters also approved the largely symbolic name change from the current ‘Republic of South Ossetia’ to ‘Republic of South Ossetia – the State of Alania’, emphasising strong ties to the Russian Republic of North Ossetia – Alania. Both Bibilov and Tibilov were strongly pro-Russian but Tibilov was a much more comfortable candidate for Moscow, that is also why he was openly backed by Russian officials. The main question is when and how should South Ossetia join Russia. While Bibilov advocates for a referendum on joining Russia to be held before the end of 2017, Tibilov had a much more gradual approach. Although some argue that we are seeing another annexation, this move is very unlikely in the near future. Not only did the Kremlin support a more moderate candidate, but for Russia there is not much to gain by annexing the territory. Russia now has a military unity with South Ossetia and full access to all the strategic bases. Moreover, the de facto country is mostly run by Russian officials working under Tibilov. Despite the strategic importance (some bases are only as little as 50km from the Presidential Palace in Tbilisi) the territory is more of an economic burden for Russia. The Turkish people voted in a referendum on changing the political system from parliamentary to presidential while granting the president sweeping powers in the shadow of the continuing state of emergency. The ‘Evet’ (Yes) camp won by a narrow margin over the ‘Hayir’ (No) alternative, approving many constitutional changes. In a parallel to the Brexit vote or the US presidential election, the largest key cities – Istanbul, Ankara and Izmir – voted against the proposition. The constitutional reform essentially signals an end to the Turkish, already barely functioning, democratic system of checks and balances. But for many voters, the referendum was essentially about confidence in Erdogan’s ability to deliver stability and security. The support now allows for Erdogan to quietly continue his crackdown on opposition. Some also fear for the future of Turkey’s relations with the EU. Over the long term, the Turkish vote is sometimes perceived as a historic turning point in modern Turkish history. You can read more about the consequences of the vote and the accompanying internal divisions in Turkey in our most recent Policy Paper by Matúš Jevčák here. Offensive cyber tools and online hybrid warfare are now an integral part of the political process in the South Caucasus. In Azerbaijan, blocking of the media critical to the Aliyev regime is nothing new. But using DDoS (denial-of-service) attacks in order to block a specific coverage (in this case the appointment of Aliyev’s wife Mehriban as vice president) is different. The attacks were traced to the newly established Ministry of Transport, Communications and High Technologies. The government is also likely attacking individual activists, journalists or opposition leaders by targeted malware and spear phishing. Leaked conversation with Hacking Team reveals that the government bought sophisticated spyware from the company in 2015, but lacked the skills to use it. Many now turn to social media to avoid government censorship, but are not safe there either. 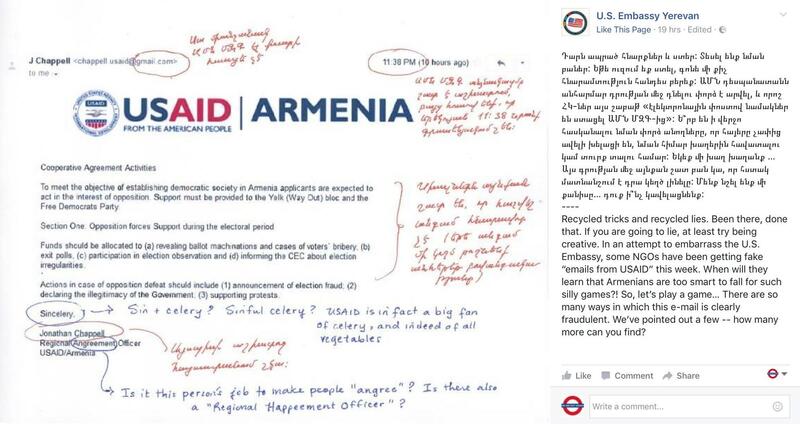 The US Embassy in Yerevan satirically corrected errors in the fake USAID letter. In Armenia, the historic election atthe beginning of April turned out to be much less eventful then some anticipated. Although there were serious cases of vote-buying and attacks on reporters, the vote was generally viewed as free and fair and the ruling republican party secured a victory. Nevertheless, prior to the election there were cases of cyber-attacks on specific activists. In late March, many Russian-language Twitter accounts started sharing a fake USAID letter indicating its support to the opposition ‘Yelk’ (Exit) movement. Analysts suggest that the Twitter accounts sharing the letter were coordinated bots and some of them were also used during the recent anti-corruption protests in Russia.